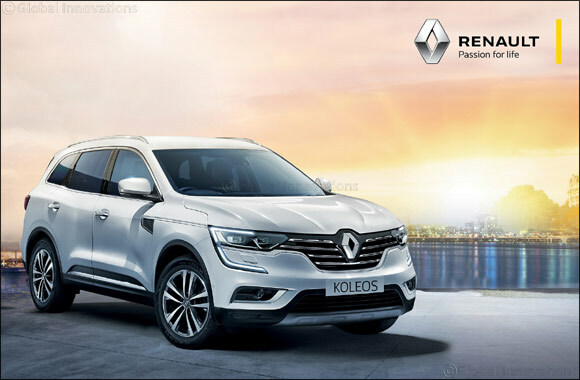 Kuwait – 29 January 2019:- Abdulmohsen Abdulaziz Al Babtain Co., the authorized agent of Renault in the State of Kuwait is delighted to announce that customers can avail of the exciting offer that comes with the Renault Koleos 2019. With an exceptional starting price of only KD 6,499, the outstanding model includes a ten year warranty and 50,000 KM free maintenance. The Renault Koleos exterior holds a taste for adventure all that is expected of a D-segment SUV. It’s robust and muscular features amplifies the athletic exterior design with door protective moldings, large diameter two-tone alloy wheels, alloy roof rails, shark antenna, fender chrome lines and silver front skid. The four wheel drive technology, all-terrain ability, engine and transmission line-up has been tailored to meet the needs and expectations of the Kuwaiti market. The 2.5-litre petrol engine is also an atmospheric, four-cylinder, power is 170hp (126kW) at 6,000rpm, with peak torque of 233Nm at 4,000rpm. The Renault Koleos captures everyone's attention with an athletic profile, robust front end, roomy seats, taut lines underscored with chrome, and C-Shape LED Daytime Running Lights. Ensuring unique driving experiences, it comes with ambient lighting, panoramic sunroof, 8.7” touchscreen tablet with R-Link 2 multimedia & navigation system, and Bose® Sound System. Further backed by a wide interior with premium looking, refined materials and details, high tech digital cluster, ventilated power seats, wide door opening, cooled cup holders, generous storage space, & sliding armrest. Renault Al Babtain invites its Renault fans to avail of the exclusive offer by visiting its showroom in Al-Rai.